It’s wet and windy, so I’m in car. The roads are hell. Daughter’s laptop is having problems installing the latest gargantuan Windows 10 update, which seems to need almost as much space as the operating system itself. Her modestly sized laptop just can’t handle it, even after having deleted everything but the operating system off it. I reckon this counts as a case of misselling but Acer, who made it, don’t agree but only because they didn’t sell it to us. Tesco did. Talk about ducking the bullets. Now I just need to try and find the receipt from Tesco. 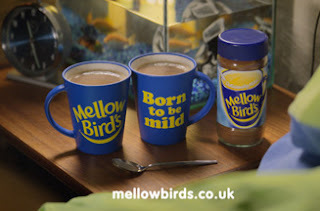 Talking of misselling, L goes out and buys some Mellow Birds. I warned her not but she still went ahead and got some. This is the product that they missold as coffee back in the 1970s. The advertising campaign promised that it would make us smile but it was more of a grimace really. It was what you served guests when you don’t want them to visit again. L says it was hidden down on a bottom shelf with the Camp. Which says it all, they can’t put either of those with the coffee because neither of them have ever been anywhere near a coffee bean. Rumour has it that they are still selling off old stock from the 70s. Bet she can’t drink a whole mug of it. Squash tonight, L and MD walk there. Then both dogs join us in the pub afterwards.